It is important to have an Adobe Acrobat “.pdf” file viewer installed on your computer. Most computer companies offer product manuals on their websites. Almost all of these manuals are in Adobe PDF format. There are also a lot of companies that send memos to their employees in PDF format. At my job top management sends multiple memos to its employees every week in Adobe Acrobat PDF format. There are many other companies that offer various information on their website in PDF format. 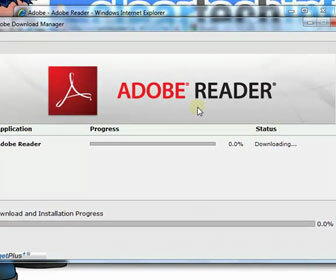 [adblockingdetector id=”2″]The Adobe Acrobat Reader is the most widely used PDF file reader. The video below will show you how to install it. For those that are wondering, yes, the Adobe Acrobat Reader is 100% free to use. Adobe only charges for the “Professional” version. The Adobe Acrobat Professional version allows you to create and edit PDF files while the Acrobat Reader only allows you to View them.